The Victron EasySolar 48/3000-35-50 3kW All-in-One Off-Grid combines a MPPT Solar Charge Controller, an inverter/charger and AC distribution in one enclosure. The product is easy to install, with a minimum of wiring. and two 16A circuit breakers. An additional 16A output is controlled by the AC input: it will switch on only when AC is available. Victron Energy B.V. designs and sells power solutions for automotive, industrial, marine, mobility, off-grid, and telecom markets. 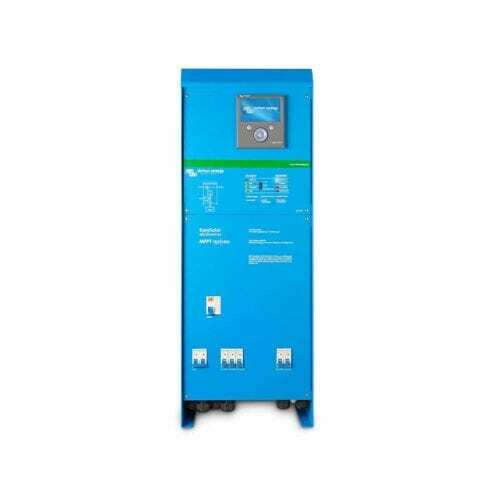 Its products include inverters, chargers, inverter/chargers, isolation transformers, autotransformers, battery monitors, batteries, panels and system monitoring products, DC distribution systems, transfer switches, cables, battery isolators and combiners, DC/DC converters, battery protection products, multipower products, solar products, solar charge controllers, and solar inverters and panels. The Company was founded in 1975 and is based in Almere Haven, the Netherlands. Join our ZERO Home Bills Community. The BEST Off-Grid Solar Products from Victron Energy at BEST Prices for ZERO Home Bills on ZEROhomebills.com by Solaranna. Rated Power: 1000 W Phase: 1 MPPT: 1 Guarantee: 5 years, can be extended up to 20.